Pixar have always produced the best of the kids’ CGI films, but with Cars it seems that they may have run out of steam. There’s nothing wrong with the film per se, except for the fact that we’ve seen it all before. This is a quality kids flick, but the usually effective high standards maintained by Pixar seemed to have worked against this film, which has no peaks or troughs, rather maintains a steady, even level of storytelling. All the proper family values and morals are on display here, but it’s missing something crucial. The main problem may have been with their choice of personification this time around. The cars simply aren’t expressive enough. I felt like I knew the characters only through their voices – the chassis were nothing but colour. Maybe it has to do with having to stick to the appearance of the actual cars on which they were based, but there’s something depressingly bland about these characters. The exception would be Larry The Cable Guy’s Mater, who is the only vehicle to effectively express himself visually. This could have to do with the fact that all the other main characters are shiny and perfect like a collector’s dream – it’s hard to believe that mayor Doc Hudson is really as old as he sounds when he’s sparkling as if he’s just rolled off the production line. Overall the voice talent is top notch as one expects these days, even if Owen Wilson (Wedding Crashers) is annoyingly ubiquitous right now. There are only a handful of moments that come close to the non-stop hilarity of Monsters, Inc. and The Incredibles, but the majority of the film is pleasantly entertaining. There are a couple of musical montages that are frustrating because they achieve nothing other than to extend the running time. It’s way too long, clocking in at two hours – outrageous for this kind of film. Cars is beautifully rendered, and the editing in particular is impressive. The landscape is perhaps more effective at conveying the story than the cars themselves, with Radiator Springs a beautiful realisation of ‘the town that time forgot’. Pixar certainly haven’t lost the knack of knowing just how finite the detail should be in an animation. One wonders if we are almost reaching saturation point with kids’ CGI films these days. If it’s not Pixar it’s Dreamworks Animation or PDI putting something out, and Disney has been having a crack at it in a solo capacity also (although I must confess I have lost track of which company owns which). There’s just too much out there. This entry was posted in Film Reviews and tagged Childrens, Comedy by Stuart Wilson. Bookmark the permalink. After the critical raves given to the massively over-rated The Incredibles, it seems Pixar were always going to struggle to gain similar support for their follow-up. Interestingly, Cars is at least as enjoyable as its more-hyped predecessor. Following the well-worn Pixar track of giving human characteristics to non-human objects in order to tell an educational story to our children about family values, Cars hits all of the right notes. Although certainly never inspired, Cars is an adequate and relatively enjoyable tale, that ends with the requisite lesson in life. What can be wrong with that? Cars features excellent voice-acting by Owen Wilson and Bonnie Hunt, and a supporting turn from Paul Newman that adds an element of class to a cast that otherwise features such luminaries as Larry The Cable Guy, Cheech Marin and Tony Shalhoub. The animation of the c(h)ar(acter)s is expressive and amusing, with Mater particularly enjoyable, and Lightning McQueen quite eyecatching. The tractors – reimagined as cattle for this tale – are also great fun. Newman and Hunt provide the more sober counterpoint to the antics of Wilson and Larry The Cable Guy, and both bring their experience and timing to their vocal performances. Cars only fails in that it is too long for its relatively straightforward story. While the actors work hard to maintain the excitement, they are thwarted by a running time of almost two hours that is far too excessive for this kind of film. Viewed in an audience filled with young children, many of whom were talking and running around instead of enthralled by the on-screen action, one can’t help but think Pixar may have missed their target audience. Perhaps with a little less of the mid-film padding, a more streamlined Cars would have maintained the kids’ attention? There are the usual collection of references to their own work to be found throughout, including an ever-so-brief glimpse of the powerline sitting birds from For the Birds during one highway scene, and the final credits feature a new take on some of the Pixar oeuvre that is worth waiting for. Pixar seems to be in the enviable position of being able to get away with this sort of gratuitous self-cross-promotion. For anyone who has previously enjoyed the work of the Pixar team – and there are many of those, with the aforementioned The Incredibles, as well as Toy Story, Toy Story 2, A Bug’s Life, Monsters, Inc. and Finding Nemo some of the most-beloved children’s films of this generation – Cars will be a welcome addition to that illustrious list. 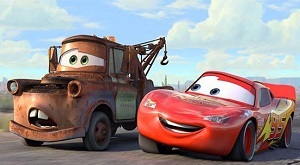 Although never scaling the heights of the original Toy Story, (which remains my own personal favourite), Cars is a bright, distracting piece of fun, that, although flawed, will surely live on in the dvd collections of many.